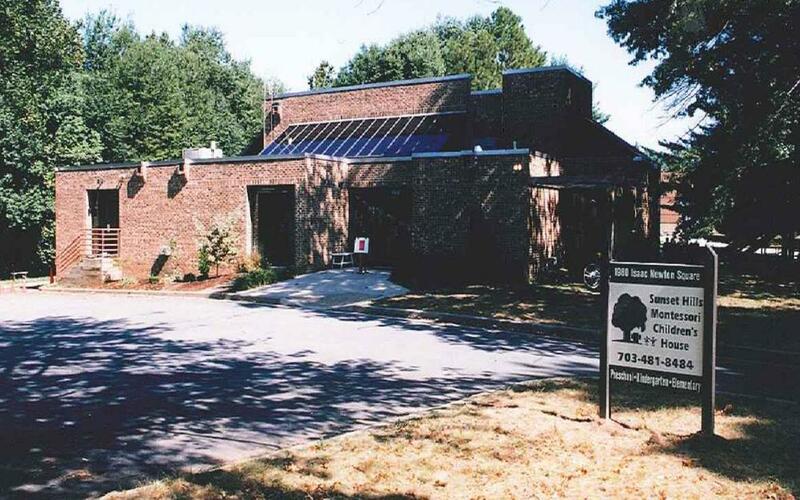 Eileen and Joe Minarik purchase a building at 1980 Isaac Newton Square West in Reston’s first office park to house a new Montessori School. The building, which was 4,350 square feet, had been vacant for 4 years and was in need of major repair. The Minariks embarked on an extensive renovation project that would take four months to complete. Sunset Hills Montessori Children’s House opens with 40 students in 2 Primary classrooms (preschool-kindergarten). The before school and after school programs are called "Sunset Club". Sunset Hills Montessori Children’s House opens for the 1995-96 school year with 80 students in three Primary classrooms. SHMCH adds an Elementary Program. The Teacher Workroom is converted into an additional classroom and six children join the school as 1st graders. The Elementary Program outgrows the classroom at Isaac Newton Square. The Elementary Program moves to rented space at the Unitarian Universalist Church on Wiehle Avenue about a mile from the Isaac Newton Square Campus. SHMCH opens a Pre-Primary class (toddler) with 12 children at the Isaac Newton Square Campus. The Minariks buy the former United Christian Parish property in Reston’s South Lakes Village neighborhood. The property is 2-1/2 acres with a 12,000 square foot church. The Minariks hire the original architect of the church, Lawrence Cook, to renovate the building to house a school. It is called the Ridge Heights Campus. The Elementary program, which has now grown to encompass grades 1 to 4, moves into temporary classrooms in the former sanctuary at the Ridge Heights Campus while the lower level continues to be renovated. Four Primary classrooms and a Toddler classroom are housed at Isaac Newton Square. SHMCH retains Lawrence Cook to design an addition to the original building. Two primary classrooms move from Isaac Newton Square to the new classroom at the former church. The school changes its name from Sunset Hills Montessori Children’s House to Sunset Hills Montessori School (SHMS) to reflect the growth of the school from toddler to grade 6. The main office of the school moves to Ridge Heights. A playground is installed. The school continues to operate in two locations. A Pre-Primary class opens at Ridge Heights. Ridge Heights now houses 1 Pre-Primary class, two Primary classes, 1 Lower Elementary class (grades 1-4). Isaac Newton Square now houses 1 Pre-Primary class and 2 Primary classes. SHMS breaks ground for a nearly 12,000 square foot addition to the original church building. The Minarik’s sell the Isaac Newton Square Campus. All classes are housed in the original building at the Ridge Heights campus. One of the Pre-Primary classes is housed in temporary quarters in the Teacher's Lounge. Two primary classes take up temporary status in half of the former sanctuary. The addition opens. The school is now nearly 24,000 square feet. The addition contains two Pre-Primary classrooms, five Primary classrooms, a Lower Elementary classroom, a Multi-Purpose Room, four administrative offices, a new foyer and storage space. The former sanctuary is now an Assembly Hall. A second playground is installed. Sunset Hills Montessori School celebrates its 20th anniversary and school founder, Eileen Minarik, reflects upon the hundreds of students that have grown up with the school.